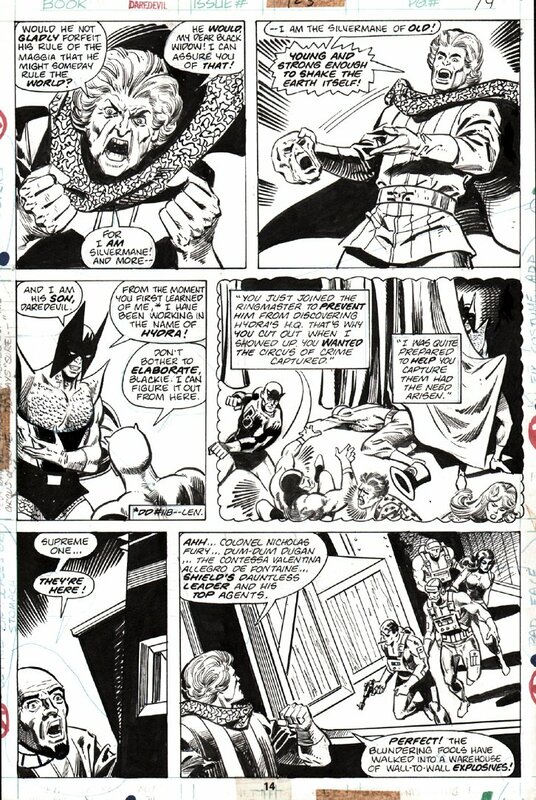 Check out this very nice 1975 DD page which was penciled by Bob Brown, and inked by Vince Colletta, from the story titled: "Holocaust In the Halls of HYDRA!" This nice page features Daredevil, Dum Dum Dugan, Valentina De Fontaine, and Nick Fury, as they confront Hydra and Silvermane! Nice page! ALL art on our website (including this one) are able to be purchased with VERY fair time payments, and trades are always considered towards "ANY" art on our website! Just send us an email to mikeburkey@aol.com and we can try to work something out.